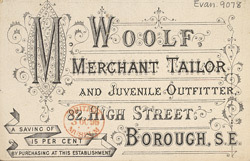 This is an advertisement for M. Woolfe, tailors. During the 19th century, men's clothing became much more simple and far less extravagant and flamboyant than in previous centuries. The most important development of the period was the transformation of men’s knee breeches into ankle length and straight trousers. The 19th century also saw the introduction of the lounge suit that is still popular today. Colours were more sombre, reflecting the change in attitude of the industrial revolution and the emergence of the professional worker. Suits were worn daily for both formal and informal events and black, grey and brown were popular colours.